Stella Zhang was born in Beijing, China. She learned painting from her father the acclaimed brush painter Ping Zhang who was a professor at the Central Academy of Fine Arts. She attended the high school of Central Academy of Fine Arts. Then matriculated to the Central Academy of Fine Arts where she received her BFA in Chinese Brush Paining in 1989. She moved to Japan in 1990 where she studied Japanese Painting at Tama Fine Art University and later at Tokyo Art University where she earned her MFA in Japanese Painting in 1996. She has lived in the United States since 2003. 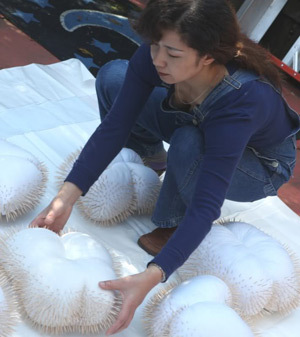 In the past 20 years, her work has been exhibited in Chinese, Japanese and American galleries and museums. Her work has been included in fine arts collections in many countries. She has published six books.